Today’s global market necessitates effective customs brokerage. With trade laws and regulations changing even faster than the industries affected by them, it’s important to maximize efficiency and eliminate fines when moving your freight across countries. AIT’s team can ensure smooth sailing for overseas exports and imports, keeping your shipments moving along and allowing you to focus on your core business. Our customs brokers help manage risks, working with our partners and customs agents to reduce clearance delays, navigate trade standards and regulations, and submit the relevant documentation. AIT Customs Brokerage is a licensed provider that helps guide your shipments past customs hurdles, partnering with you to keep your air and sea freight shipments moving, on time and problem free. We offer compliance with the FDA, USDA, DOT and C-TPAT, in addition to compliance support for EPA, FWS and other entities. No matter your industry, we simplify importing and exporting. AIT’s team works hard to keep you covered from pickup to delivery. Automated electronic interfacing and pre-clearance through U.S. Customs expedite customs processes, even for complex entries. Remote Location Filing (RLF) allows for hassle-free customs clearance in all ports. Strategic locations give us in-depth shipping knowledge and customs insight for your freight needs. We offer “Wheels Up” services, which allow freight to be cleared by U.S. customs while airborne, meaning faster shipping, easier transit and quicker clearance. AIT’s online tracking capability through MyAIT means you always know where your shipments are, including real-time customs clearance updates. AIT’s extensive experience across industries provides us with the tools to serve you and the customs brokerage abilities to keep your freight moving. Customs brokerage is only as effective as the company you work with. When searching for an import brokerage partner, you’ll want a knowledgeable, reliable provider that clears an easy path for your freight by getting ahead of clearance documents, reducing the risk of penalties and helping your shipment move quickly across borders. Expedited Clearance: By partnering with AIT Customs Brokerage you will receive the benefits of programs like “Wheels Up” services, Remote Location Filing (RLF) and priority clearances for Canada and Mexico. Online Tracking: Stay on top of your exports and imports by choosing a partner that offers electronic monitoring and reporting. Our MyAIT online portal provides real-time clearance updates, PGA releases and delivery details. Document upload and print options improve communication efficiencies. Expert Experience: With frequent regulatory changes and schedules constantly in flux, international shipping and customs brokerage can be a chaotic world. With years of industry experience, our expert team will work with you to bring a steady hand to your freight transit. Set yourself up for success by relying on AIT’s brokerage team to handle even the most complex entries. AIT actively protects your cargo while providing timely and accurate customs clearance. 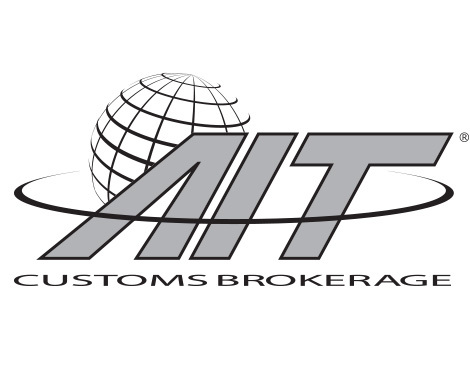 Leverage the expertise of the AIT Customs Brokerage team. AIT reduces clearance delays and speeds up transit times.